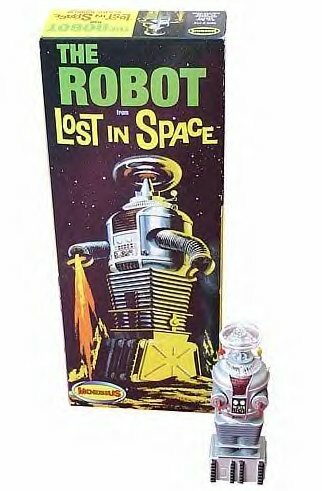 The great folks over at Moebius Models have released the tiny B9 Robot model that comes in their Lost in Space Chariot kit all by himself! In a very small replica of the original Aurora Robot model box. The Robot stands only a few inches tall, making this a great model kit for a 1:6 scale action figure (like the Sci-Fi Metropolis Dr. Smith figure. This is NOT the Polar Lights re-issue of the Aurora kit. This is the miniature Robot from Moebius's Chariot kit. This model kit must be assembled and painted. No glue or paint is included. This kit is scheduled to ship in May, 2009.